You've all seen (or smelled) this nasty eating habit. From McDonalds' fries to Chinese take-out, fellow commuters are getting down on some less-than-classy foods. Yes, I've occasionally enjoyed a Luna Bar when rushing to the gym and I always sip my morning iced coffee from Paradiso en route to the office, but I've never, ever devoured a full meal on the train. I've witnessed others eating everything from fried shrimp in a brown bag, to wings, and even sushi, without a care for the cleanliness of their habits or the offensive odor their cuisine is omitting. Altho' I'm a fan of snacking on the subway, bus or train, I'd have to say....egg salad was the grossest I've witnessed AND smelled! 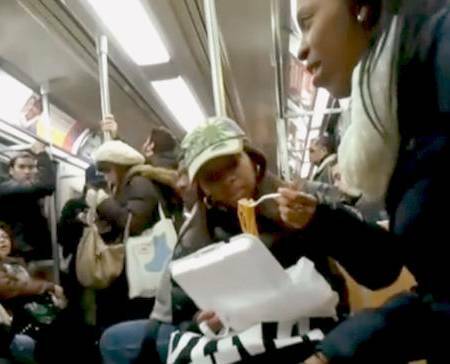 I do not know how people can eat on a subway. I know my ex used to dine on the subway because his job required him to walk around the city so the subway was his only place to grab a bite. I have seen people eat chinese food and mcDonalds. But the most disturbing thing was someone devouring a 2 piece fried chicken snack box at 7am on the crowded J Train... and how badly I wanted that chicken so early in the morning. I'm sorry...I love me a tuna salad sandwich. But, NOT in a non-ventilated train packed with sweaty men and crying kids. In JULY. Ugh, this is such a pet peeve of mine. I think the worst is fried chicken, and spitting the bones out everywhere. Ew.